Slowly we were getting out of the high mountains and descended under the timberline with subtropical vegetation. Hundreds, maybe thousands of different botanical species as bromelias, orchids, begonias ferns, mosses and countless flowers spreading pleasant perfumes. Many herbs were never investigated or aren't known to biologists. 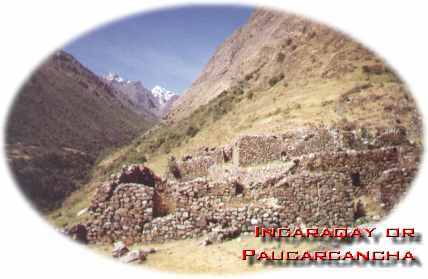 We were still following the Cusichaca River and arrived in the afternoon at an Inca ruin called Incaraqay or locally known as Paucarcancha. Surrounded by Inca terraces and constructed at the strategic point were two valleys come together, this ruin has served as a lodging for the chasquis. As said before, these runners were very important to the Inca empire for their administration and transporting goods. Storerooms kept the dried food save in case of disasters, war or shortage. Unfortunately, earthquakes damaged the ruin severely. As seen on the pictures above, a lot of work has to be done to restore Paucarcancha. Resources come from tourism and little by little parts of the ruin are rebuild. The Temple of the Sun and the nearby rooms have been reconstructed. No entrance fee is asked. There are some houses in the valley but no shops. The wide terraces and the ruin itself can be used as campsites. It has to be said that between Mollepata and Wayllabamba, almost no hikers are seen. Making a trek in this part of the Inca Trail is free. Paucarcancha is the only Inca ruin on the trail before getting on the really busy trail from Wayllabamba (km88) to Machu Picchu. More than 15.000 people visit the trail every year. Don't try to walk this trail without a guide who knows the place and a expedition-like organization with food, horses, a cook, carriers and so on. Nature is beautiful but very rough out there! The Cusichaca River in the valley is the only source of water. Taking a bath in this stream is only possible to polar beers. The water comes mainly from glaciers. The valley is covered in subtropical rain forest and the Incas built along the river a kilometers long dike. This enormous works were executed to protect the terraces that are still in use by local farmers.